After three weeks of holiday, I’m dragging myself back to work this morning and feeling rather unhappy about the situation. So allow me to cast my mind back to those happier times three weeks ago. Before flying home to the UK for Christmas, I hopped on the train to Budapest for a few days. Budapest is a wonderful place, not least in December when it’s all festive and cold. It’s the classic European city, where you can just walk for miles and gape at all the spectacular buildings. 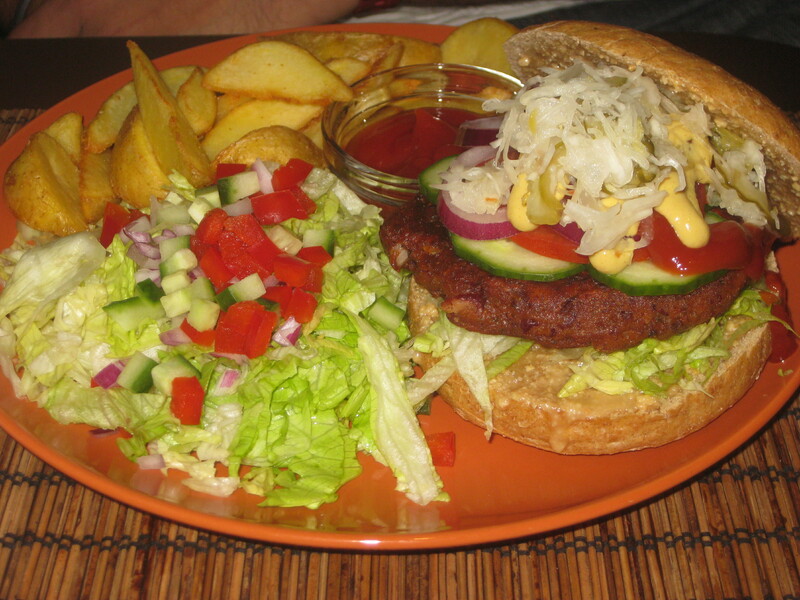 And, like so many big European cities, you can get lots of good vegan food too. We kicked things off at Napfenyes Restaurant, which has an exciting, all-vegan menu including some traditional Hungarian dishes. If you hate feeling that you’re missing out on the local cuisine when you travel as a vegan, this place would be perfect for you. 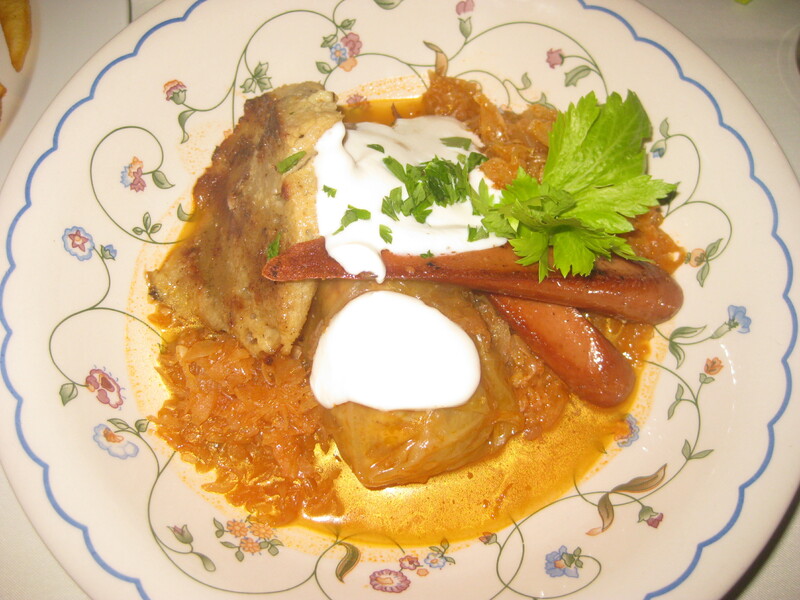 I agonised over the menu, and eventually chose the stuffed cabbage. The cabbage leaf served as a fresh spring roll wrapper, and the filling was really flavoursome. 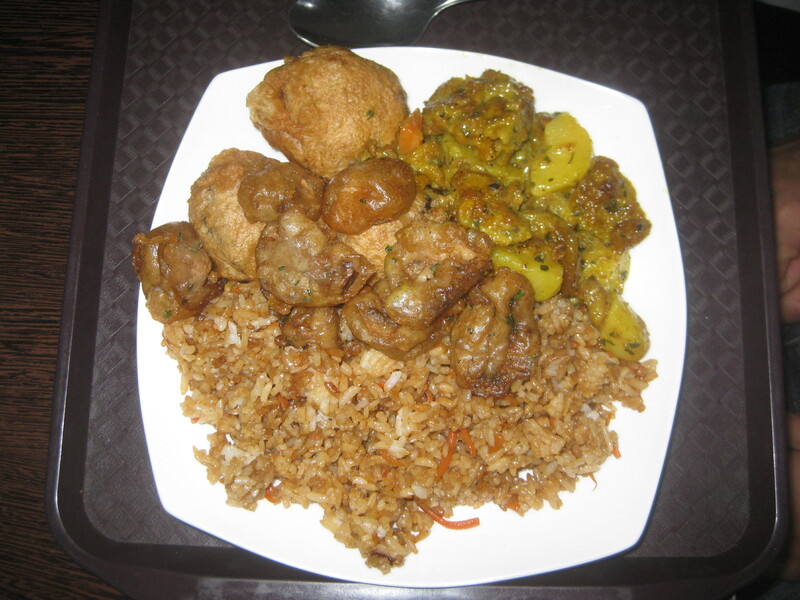 It was delicious by itself, but it had lots of accompaniments. There were two nice hotdog sausages, a seitan cutlet and some cooling yoghurt on top. There was also lots of sauerkraut, which it turns out I really don’t like. 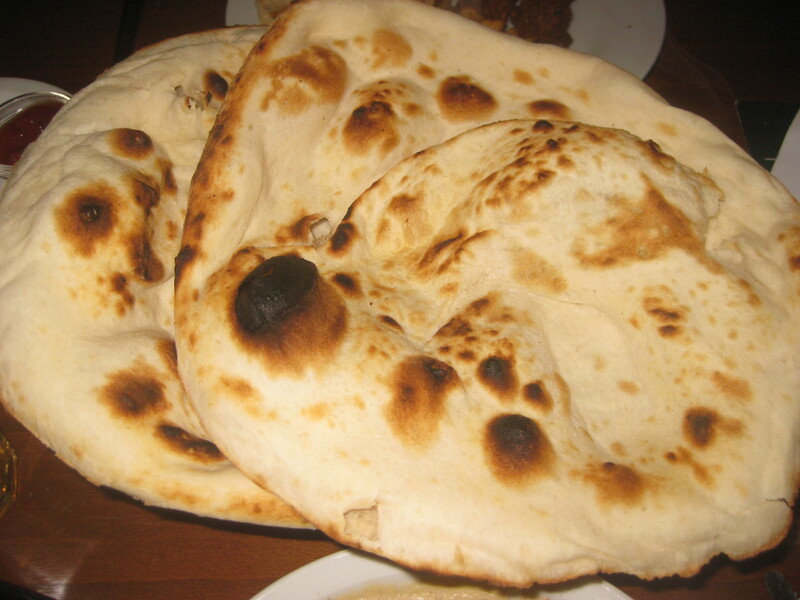 Nevertheless, it was a fantastic dish. Dr HH had the Hungarian oatcakes. 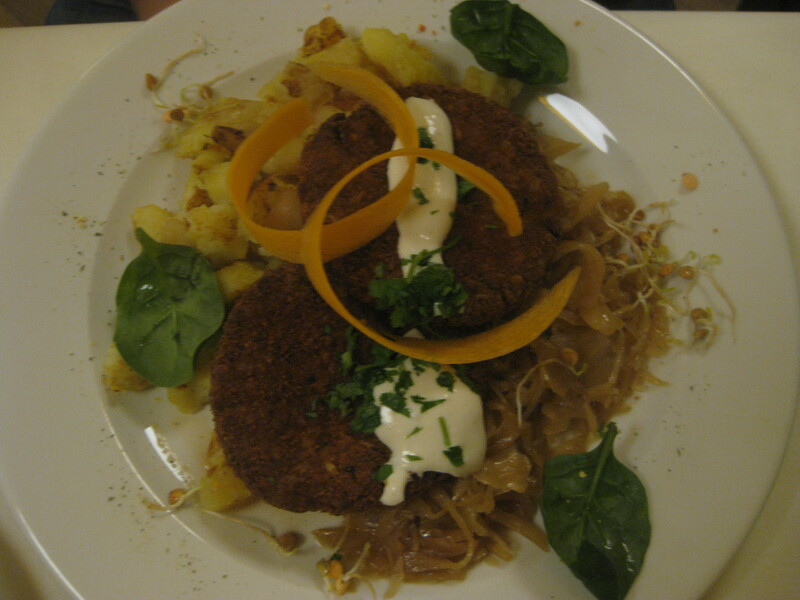 The oatcakes themselves were salty and crunchy, and were served with shredded cabbage, potatoes, mayo and parsley. He declared it a bit dry, but generally good. An enviable cake counter stands at the entrance to the restaurant – it’s perfectly acceptable just to go in for a cake, rather than a full meal. Everything looked extraordinarily tempting, but we eventually managed to narrow it down. 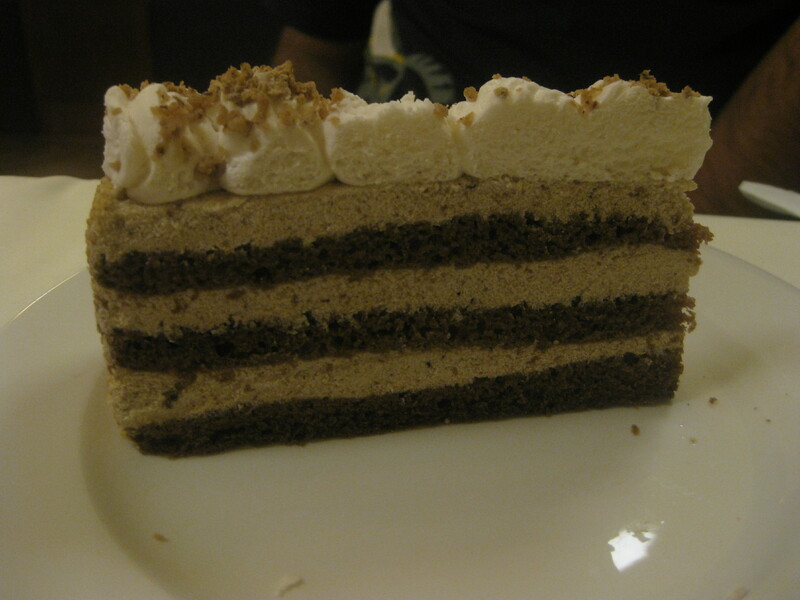 Dr HH got the chestnut cake at the top, and absolutely raved about the creaminess and layers. He said the flavour was perfect and it was not too sweet. My choice of ‘Snickers-like’ cake, on the other hand, was incredibly sweet – too much even for me. The layers of sponge and cream were nutty and delicious, but there was just too much sugar. 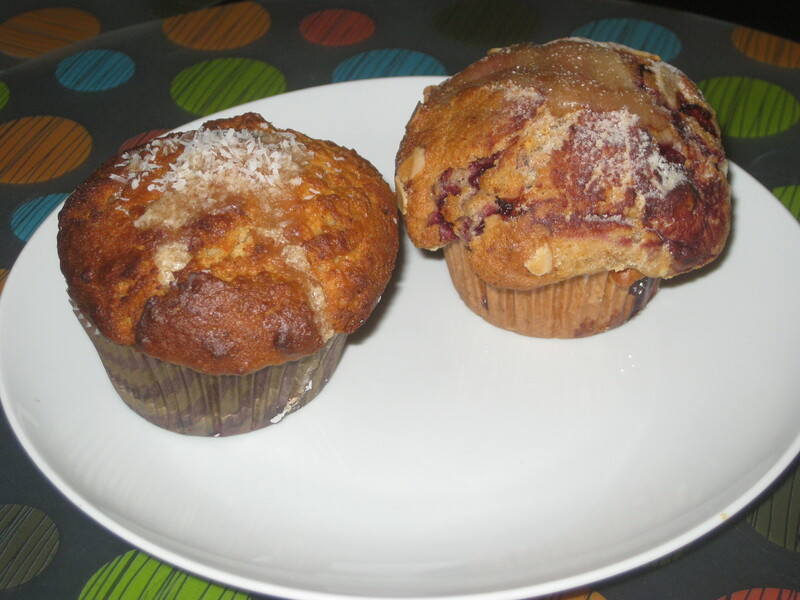 It’s also possible to get treats to take away, so for the next two mornings we breakfasted on muffins and apple pie. We were binge-watching 30 Rock at the time, so any reference to the word muffin meant that we had the song ‘Muffin Top’ going round in our heads constantly (…and here it is again). It was worth it though, because there muffin tops were indeed all that. 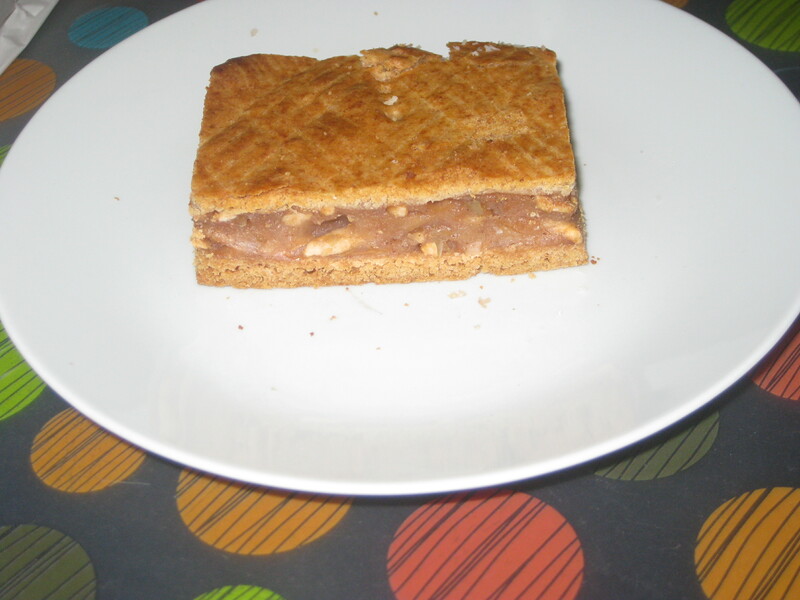 The apple pie had good flavours and a nice texture too, crunchy on the top and bottom. While Napfenyes was big and bright, Kosmosz was a cool, dark, underground eatery. It was fantastic! The service was excellent and there was an English menu too. It’s quite a small menu, which is usually an encouraging sign. I went for this seitan stew. The seitan was really flavoursome and smoky, and was served with some kind of noodly-pasta which was a bit bland on its own, but nice mixed with the seitan. I would recommend it. Dr HH had the bean burger, which he thought was nice but not mind-blowing. It was too big to be eaten with the hands, which is always disappointing, but on the plus side the little potato wedges were very good. The best part, of course, was dessert. There are only two options and we chose the layered pancake. The Hungarians love their layers, eh? 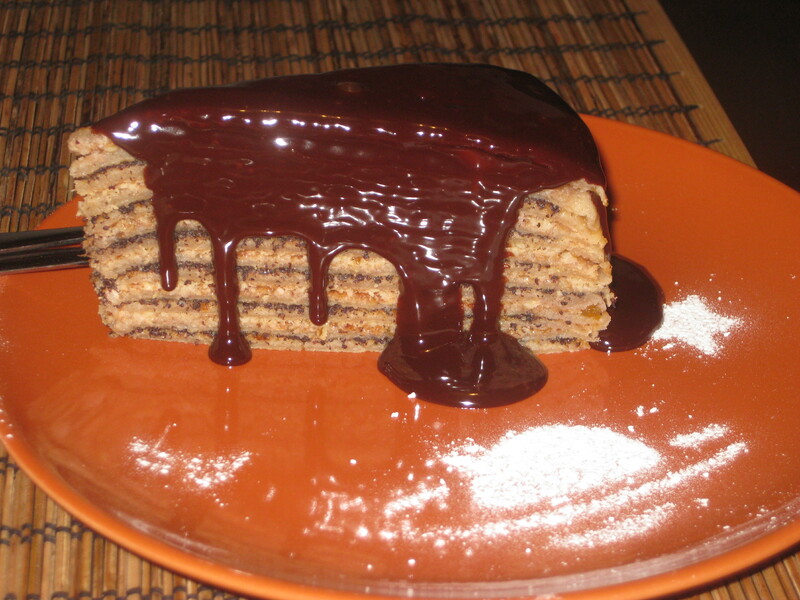 It was like a slice of cake with all these tiny layers, smothered in rich, dark chocolate sauce. Oh, it was beautiful! We just shared one slice, but I wish I’d had room for my own piece. The next day we ate at Elixir (UPDATE: closed September 2016), which was not quite what I’d expected. It’s described on Happy Cow as a bistro, but it was primarily a takeaway with only a bench for eating in. Fortunately, we were the only people eating in. Also, the Happy Cow page shows elegant looking plates of food, whereas in reality it was cafeteria style, with a few vats of different dishes. 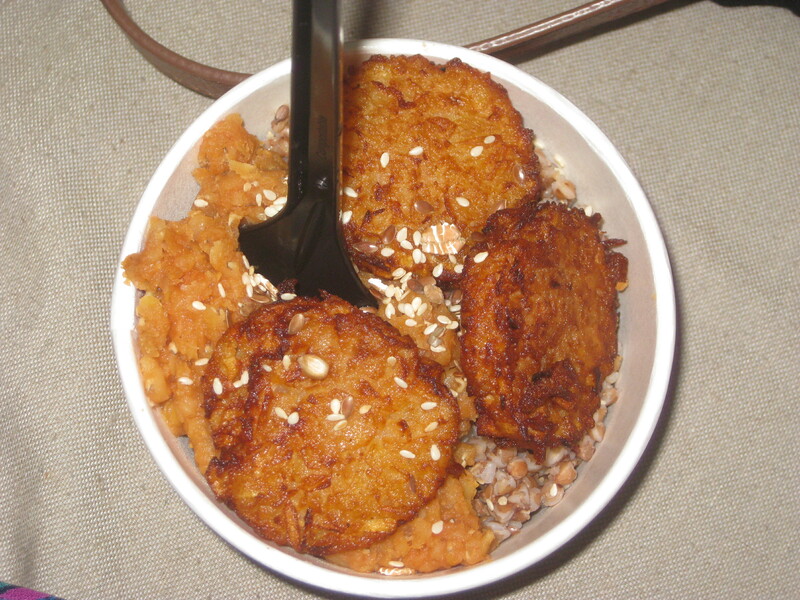 We chose three things to fill our little pots: I had buckwheat, gingery lentils and some potato cakes. Dr HH had millet with vegetables instead of buckwheat, which was probably a better choice. Everything was delicious and really filling, plus it was a nice cheap meal. The chef was really friendly and enthusiastic about vegan food, and explained in perfect English how it all worked. I’d really recommend this place, either to eat in or takeaway – just make sure you’re not expecting a fancy little bistro! In need of dessert, we headed for Napfenyes Cukraszda, a bakery connected to the restaurant we’d visited on our first night. 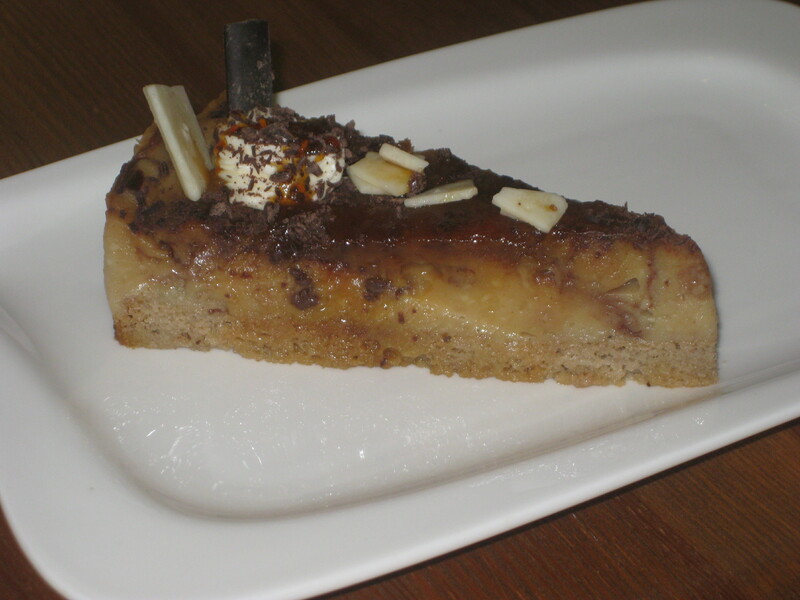 It had a different array of cakes, and seemed to focus more on cheesecakes, so that’s what we had. 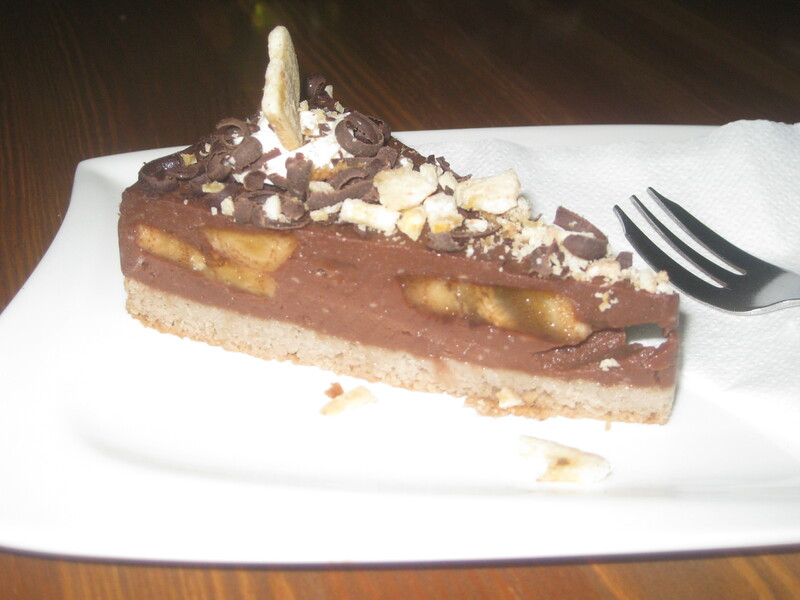 I had the banana and chocolate slice, and it was deliciously creamy. However, the base was too soft: what do you have to do to get a good crunchy base?! Dr HH said the caramel cheesecake was creamy and orangey, but not spectacular. I preferred the pastry counter in the main restaurant to be honest, but if you’re in this neck of the woods, then why not? We were both more impressed by the breakfast goods that we got to take away. 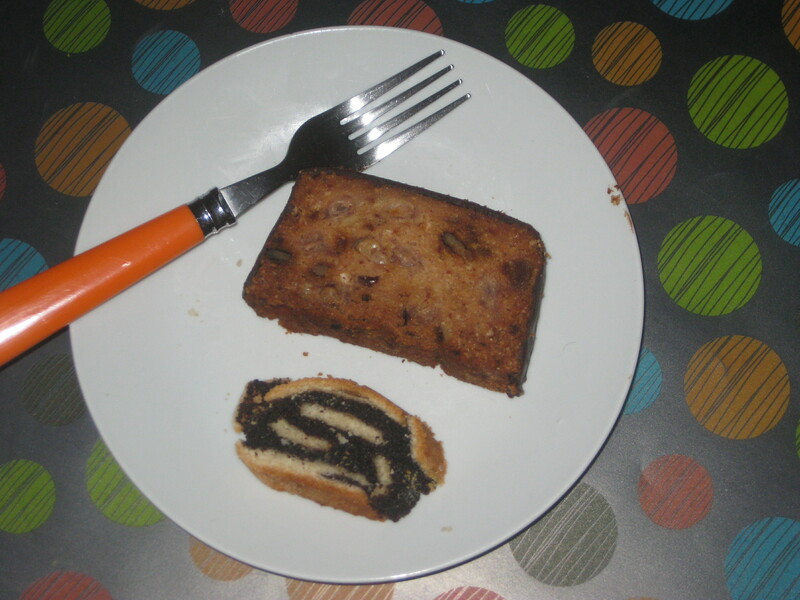 The poppy seed roll at the bottom here was nice, but the chocolate-coated loaf cake was the star of the show, really fruity and moist. We needed a bigger evening meal, so we went to 96 Zen, where all the food is vegan (but the bubble tea is not). Again, we needed some explanation: this time we chose a plate size and were allowed a certain number of sides and mains to fill it. We got 1 main and 3 sides, and were very satisfied indeed. We both had the deep-fried sushi, fried rice and deep-fried mushrooms as our sides – the sushi was exciting, but probably not as good as normal sushi. 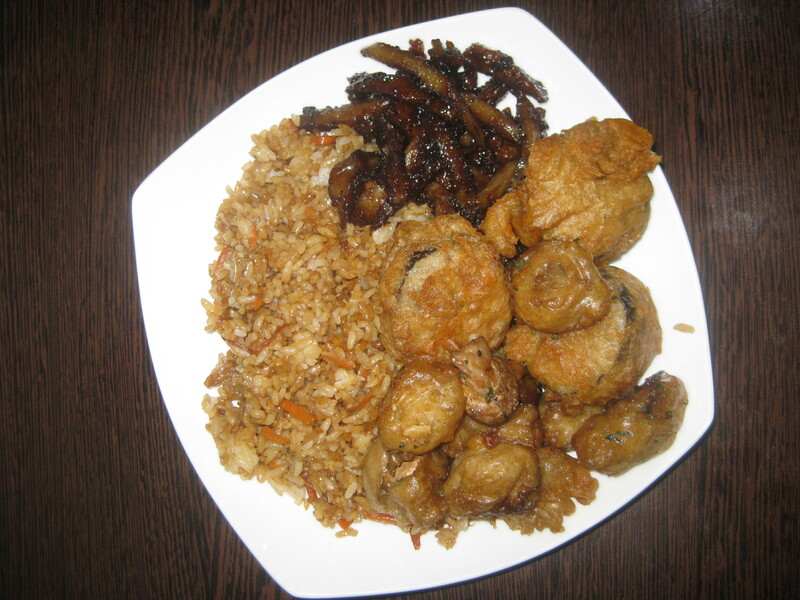 The deep-fried mushrooms were spectacular! They were so crunchy and salty, I could have eaten a whole plate of them. To accompany the rice, I chose BBQ seitan which was delicious, and Dr HH chose the coconut tofu curry and also enjoyed it. 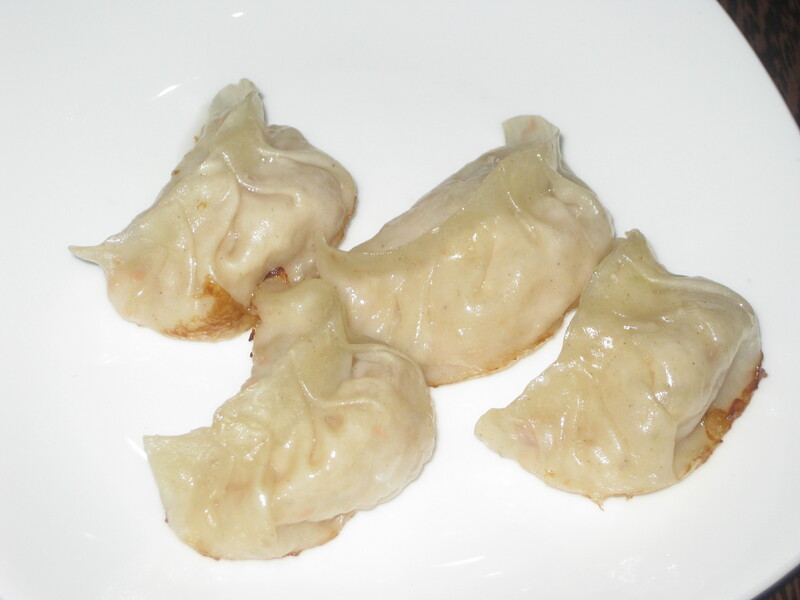 We also shared a little portion of dumplings, because we cannot resist them, and of course they were good too. The staff were incredibly friendly and, once again, explained the system in perfect English. They also blasted the food in the microwave before serving, as it had been sitting out at the counter. However, it was still only lukewarm. Nevertheless, this was good fast food and really hit the spot, and I would go back in a second. To fuel our flight back to the UK, we went to one branch of Hummus Bar. And it definitely kept us going until we got home! The branch we went to was really close to St Stephen’s Basilica, and it was one of the ones that also serves meat- there are two all-vegetarian branches too. It’s a big place with fast, English-friendly service, and we got complimentary mint tea on arrival. 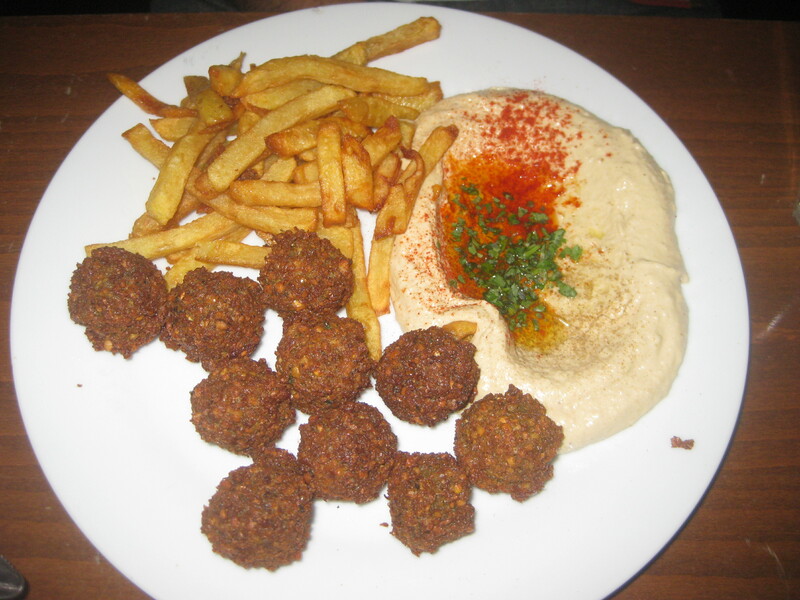 Dr HH ordered the falafel plate, which is 10 falafel balls with two sides of your choice: he got chips and hummus. It also came with some bread and two spicy dips. 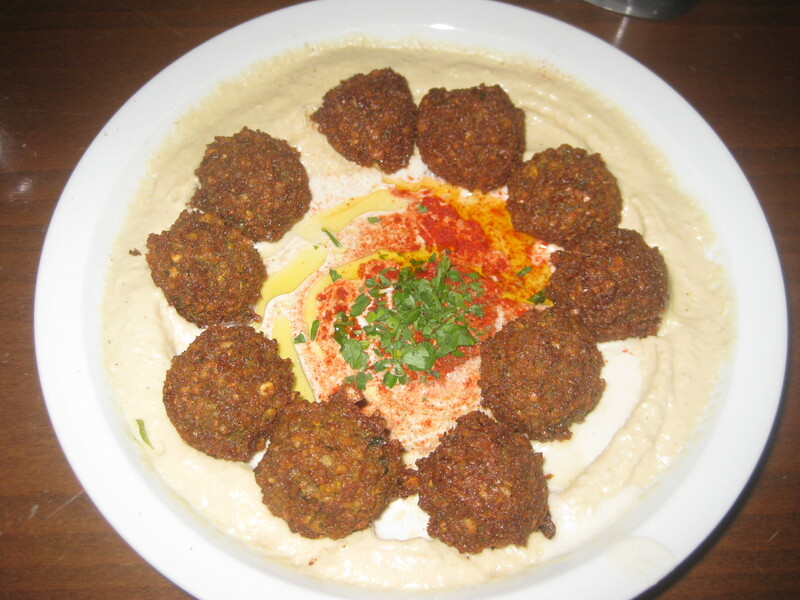 I ordered the hummus plate with falafel, which was a big bowl of hummus topped with ten falafel balls and served with another gigantic piece of bread. I think mine was the winner! The falafel was excellent: small, crispy and tasty. The hummus was also good. Ah, it was a feast! There were a few other restaurants I would have liked to visit as well, but hopefully I’ll have another chance. The December weather was cold and foggy, so it would be nice to see the city in the summer sunshine. 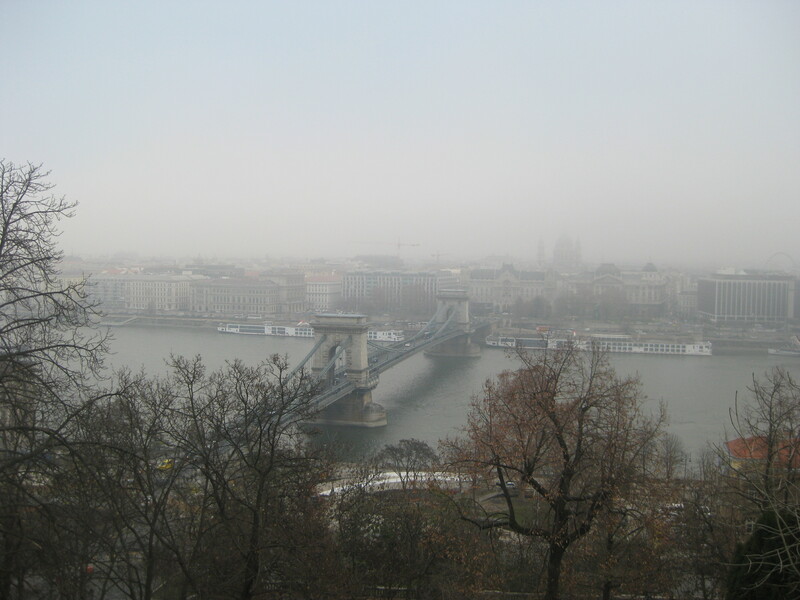 As cold as we were, we walked and walked, climbing from the Chain Bridge to the Buda Castle and enjoying the hazy view and spectacular buildings. We also strolled along the river on the Pest side and enjoyed more of the impressive buildings. One of the highlights was the trip to Szechenyi Thermal Baths. It was -1C, but the outdoor pools were heated to 37C. It was beautiful, bobbing around in the toasty water, looking up at the dark night sky, watching the steam blow across the surface and then suddenly clear. Whatever the temperature, I would heartily recommend these – though hopefully they’ll be a bit cooler if we visit one summer! This entry was posted in Travel and tagged 96 Zen Etterem Budapest, Elixir Budapest, Hummus Bar Budapest, Kosmosz Vegan Budapest, Napfenyes Budapest, vegan Budapest, vegan travel. Bookmark the permalink. I have never heard of deep fried sushi before! It sounds so decadent! To be honest, as exciting as it sounds, I think normal sushi is better. It turns out there are some things that don’t need to be deep-fried! I went to Budapest in the summer, and can confirm it’s just as lovely! I remember the food being pretty good too. 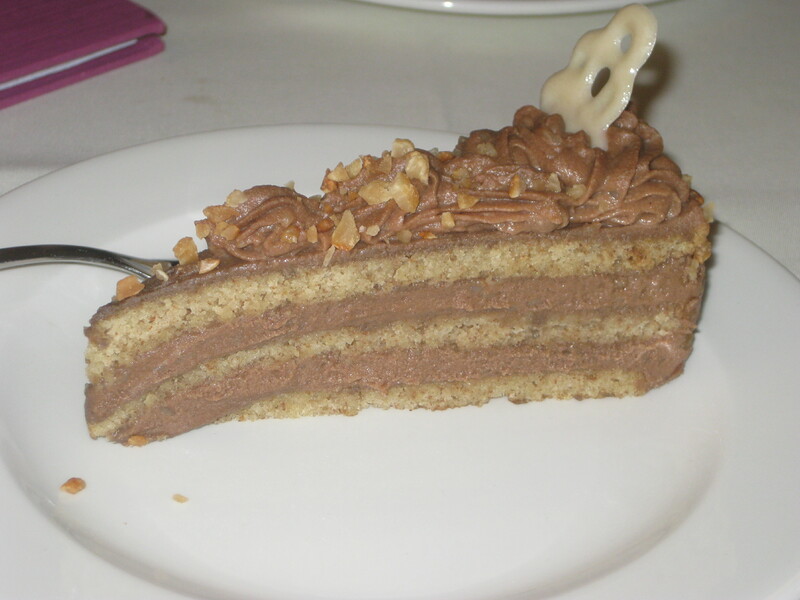 I never got to try the cakes in Napfenyes, so I’m going to enjoy yours vicariously, ditto the Kosmosz cake! 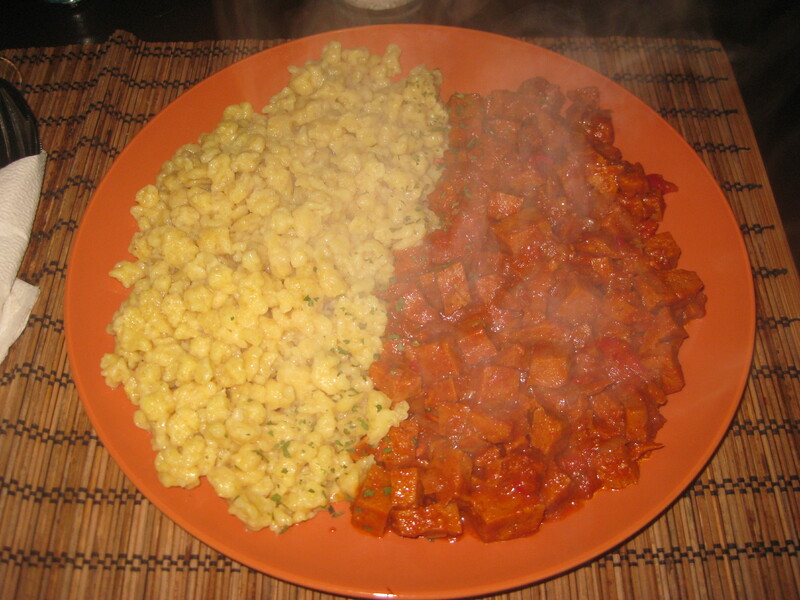 I’ve visited Budapest (and also liked it) but it was when I was vegetarian rather than vegan…I clearly need to go back! I’d love to go back to some of the places I visited as a vegetarian and see how they are for vegans. I went to Barcelona 11 years ago and had a really hard time finding veggie food, yet now I hear that it’s vegan paradise! oh my goodness that food! 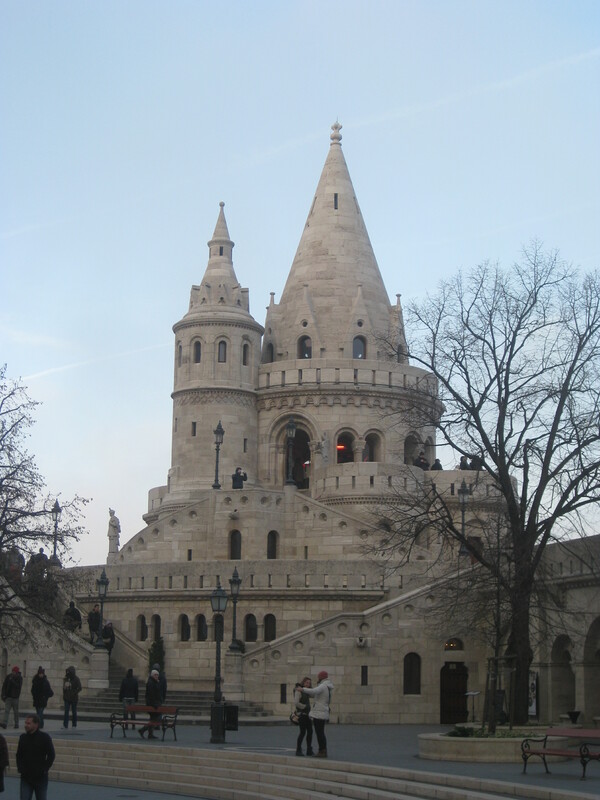 I would loooove to go to Budapest! It’s a beautiful place, and the vegan options are numerous!